As long as humans have been around, there have been babies—naturally! Motherhood is steeped in history and tradition, and even for the most well-prepared and well-researched, taking care of a baby can give rise to situations where you just don’t know which rules to follow. What Are Some Common Baby Sleep Myths? Advice from parents and grandparents may conflict with pediatricians and books. Assumptions that you’ve taken as fact for decades may turn out to be false. All of this confusion, in the face of the reality that you are caring for a defenseless, totally dependent little one that relies on your good judgment for their survival. 1. MYTH: It’s safe for you to put your baby to sleep on their side. When it comes to infant sleeping positions, there is only one truly safe position: on their back. The Safe to Sleep campaign spearheaded by the National Institute of Child Health and Human Development (NICHD) on this fact. There is a reason for the myth’s existence, though: In the early days of this campaign to reduce the risk of sudden infant death syndrome (SIDS)—when it was still called “Back to Sleep”—both on the back and on the side were considered safer than putting an infant to sleep on their stomach. However, it was changed later on due to babies being observed rolling onto their belly from the side sleeping position. Though the official stance has since been modified, the initial recommendation still persists in old educational materials and in the memories of physicians not keen on keeping up with current events. 2. MYTH: You should never wake up your sleeping baby. Why does this myth persist? Everyone seems to think that disturbing a baby’s rest is a very bad thing to do—and it’s easy to see why, because you never want deal with a possibly cranky or crying baby—but this is absolutely a myth! Case in point: What do you do if your newborn just loves to doze off, and doesn’t wake up to feed? Food is just as important as sleep. There is also the issue of preserving their normal sleep schedule. While a napping baby can be a godsend for tired parents and guardians during the day, if the nap stretches on for too long, or happens too late in the day, it can impact the baby’s nighttime sleep. The same idea applies to a baby sleeping late into the morning. What happens during nap time? 3. MYTH: Cutting out naps and delaying bedtime will help your baby sleep better and wake up later the next day. References to variations of this myth often pop up when you’re talking to someone that’s much older, particularly if they’ve also taken care of a child. Yes, mothers and grandmothers do speak from experience; but they may not be remembering things accurately. The best case against this myth comes from self-examination. Do you always sleep better after a very long day of not napping? In most cases, you will feel tired—but also still wired and restless. Same goes for your baby; try out this myth and you’ll likely experience more night wakings and less sleep time overall. Sleep is not something you can reschedule and reallocate without repercussions. Better sleep habits make for better sleep, obviously! That’s true for you, and for your baby. This myth is more than just busted! The proper way to deal with your baby’s sleep schedule is actually the polar opposite: You should absolutely put them to bed a little bit before they usually display sleepiness signs—yawning, eye-rubbing, clinginess, etc.—and also prioritize nap times during the day. 4. MYTH: Giving your baby more food will help them sleep through the night. 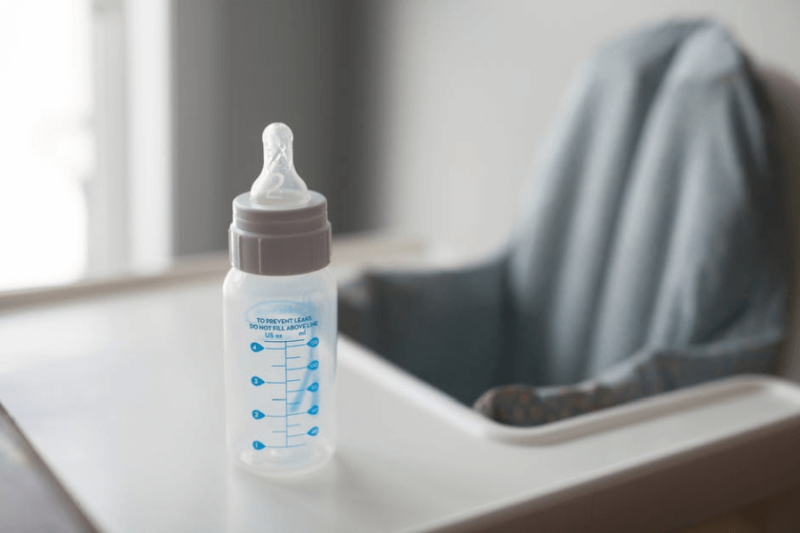 This is another myth that has many versions, but all of them involve adding food—cereal, feeding formula, rice, etc.—to your baby’s milk bottle during nighttime feeding. There are several problems with this, not even including the fact that there is no scientific basis for counting on added calories to improve sleep habits. For one, there are specific, tried and tested guidelines when it comes to feeding babies. Not following these and disregarding advice from your pediatrician may result in obesity problems later on for your child; and, more immediately, night wakings due to digestion issues. Another thing: Adults aren’t even supposed to eat right before sleeping; so what could possibly make this a good idea for babies? Frequent feedings during the newborn period is necessary—your baby’s stomach is so small at that stage that you will need to feed them constantly—but past that it’s better to focus on reinforcing good sleep habits than relying on the bottle or nursing to put your baby to sleep. 5. MYTH: “Sleeping through the night” means uninterrupted sleep for 12 hours—and your baby should be doing this at six months. First of all, not all babies are the same. Though six months is the average age when infants start to fall into a regular sleep routine, some may start sleeping through the night without incident as early as three months of age. Others may continue with regular night wakings well into their first year, or even later. Second of all, a sleep schedule of roughly 7PM to 7AM for a baby is unrealistic without night waking. Clinically speaking, a healthy amount of hours that counts as “sleeping through the night” is about nine to 10 hours. Finally, “sleeping through the night” is a problematic term in itself. As adults, we often sleep through the night—but we, too, experience full or partial wakings regularly. Same with babies! Some will learn how to self-sooth by themselves—which may result in uneventful, unassisted night wakings that may not even disrupt your sleep—but others will need to be taught, and will need time to get good at it.